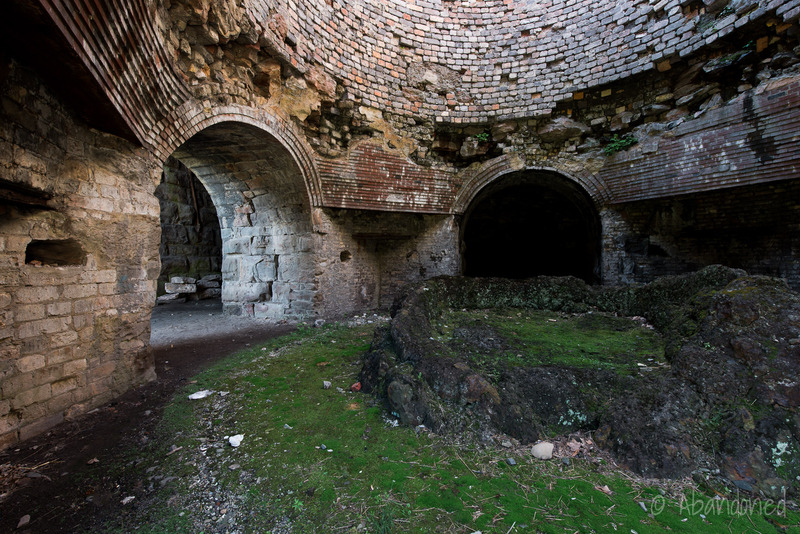 The remains of four iron furnaces, operated by the Lackawanna Iron Works, are located in Scranton, Pennsylvania. The company was instrumental in the production of nails and rails. As early as 1838, William Henry was investigating the feasibility of establishing an anthracite coal-fueled blat furnace along Roaring Brook in the Lackawanna Valley. 2 Henry had been the first American to experiment successfully with applying a hot blast to the smelting of iron ore at the Oxford Furnace in Belvidere, New Jersey. The Roaring Brook area contained abundant deposits of anthracite, limestone, and iron ore, and the reliability of Roaring Brook for water power made the furnace location ideal. Henry did not have the capital to acquire land or start-up operations, so in 1840, formed a partnership with his son-in-law Seldon Scranton, George Scranton, and Sanford Grant. 2 Together, along with Joseph and Erastus Scranton of Augusta, Georgia, they were able to purchase 503 acres in what was called “Slocum Hollow” along Roaring Brook. Later, Phillipp H. Mattes of Easton acquired a fourth interest in the firm for $5,000. 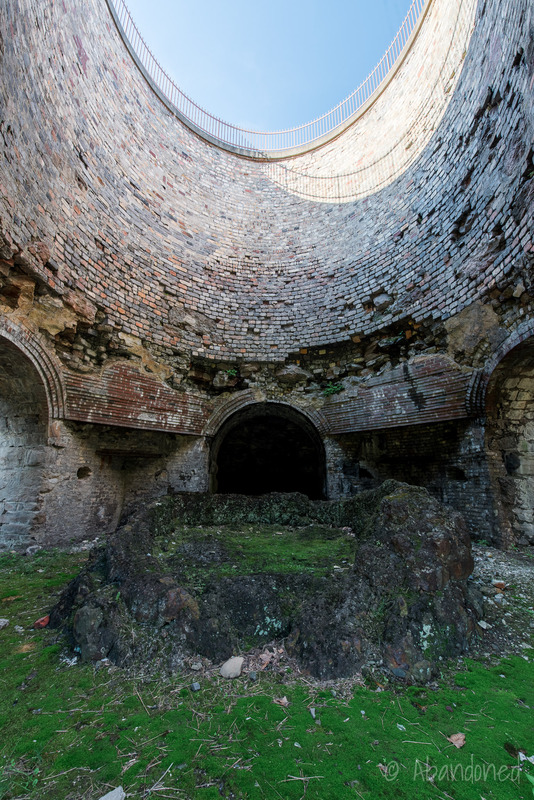 The furnaces were filled from the top with alternating layers of iron ore, anthracite coal, and limestone. 1 The heated air blast caused the coal to burn, which in turn melted the iron ore and limestone. The calcium in the limestone acted as a flux that removed impurities from the melted ore, forming slag. The furnace walls formed a funnel, which directed the molten iron into the hearth at the bottom. As the molten slag was lighter, it floated above the molten iron and was tapped off first. The furnace would be tapped every 10 to 12 hours, and an average of seven tons of iron was smelted per tap. Every 10 to 12 months, the hearth would be relined. The company had intended to produce pig iron to ship via wagon to the canal at Pittston and Honesdale. 2 But the price of iron was declining steadily and transportation costs took a toll on the company’s profitability. The partners believed that producing nails would save the company from financial ruin, but the construction of a puddling mill and nail works required additional capital. In September, the partners reorganized under the name of Scrantons & Grant, headed by George and Seldon Scranton and Sanford Grant. 2 During the same year, George and Seldon’s younger brother, Charles Scranton, became the supervisor of operations; George returned to the Oxford Furnace in New Jersey. The furnace was producing five to seven tons of pig iron a day by 1844. 2 By April, the rolling and puddling mill went into operation. Nails were manufactured from wrought iron plates, which were converted to cast iron by several reverberatories, or pudding ovens. 1 In the oven, the cast iron pigs were stacked in a slag-lined chamber and reduced to a semi-molten state. The superheated air was drawn over the pigs which caused them to melt. As the carbon burned off, it formed large pasty balls, or blooms. Workers stirred the bloom with a long iron rod tipped with slag, which released excess carbon and helped mix in iron silicate. After two hours in the oven, the bloom was removed with tongs and taken to a squeezer, where excess slag was forced out. 1 Once squeezed, the wrought iron ingot was reheated and passed between large rolls until it became a flat plate. The flat plate would then be cut into nail rods. By July, 100 kegs of nails were being produced per day, which flooded the market. 2 Additionally, the nails were brittle and broke too often while being hammered. Faced with mounting debts and declining revenue, the company switched from nail to T-rail production for the railroads. The NY&E had a contract to complete a railroad from Piermont on the Hudson River to Binghamton, New York by the end of 1848, or forfeit a $3 million contract with the state of New York. 2 Faced with the uncertainty of the domestic rail supply and the expense of T-rails from England, the NY&E placed an order for 4,000 tons of T-rail to Scrantons & Grant. The railroad inspected the rails in October and pleased with the quality of the rails, subsequently advanced $90,000 to the company, as well as an additional contract for 12,000 tons of rail. T-rail was formed by squeezing billets of hot iron between heavy cast-iron rollers. Multiple presses altered the profile until the desired shape was attained. Credit: From Steel and Iron, Greenwood, 1900. In November 1846, the company reorganized as Scrantons & Platt, which Joseph C. Platt, Joseph Scranton’s son-in-law, replacing Sanford Grant. 2 By 1847, the company boasted 800 employees. Furnace No. 2 and No. 3 were constructed in 1848-49, and in mid-1850, the company began work on the 48-mile Liggett’s Gap Railroad to connect the Lackawanna Valley and the Scrantons & Platt ironworks to the Erie Railroad at Great Bend. 2 By April 1851, the renamed Delaware & Western Railroad was hauling iron ore and coal to the furnaces, and bar iron and T-rail to customers. In 1852, Furnace No. 4 was built. In 1853, the company reorganized as the Lackawanna Iron & Coal Company (LI&C). 2 3 By 1854, the firm featured three furnaces, the rolling and puddling mills, a foundry, two blacksmith shops, two carpenter shops, a car shop, a saw mill, a grist mill, offices, a company store, a boarding house, a hotel, a tavern, 200 houses, and mines for ore and coal. The company added two double connected lever-beam steam engines to power the blasts in the furnaces in 1854. 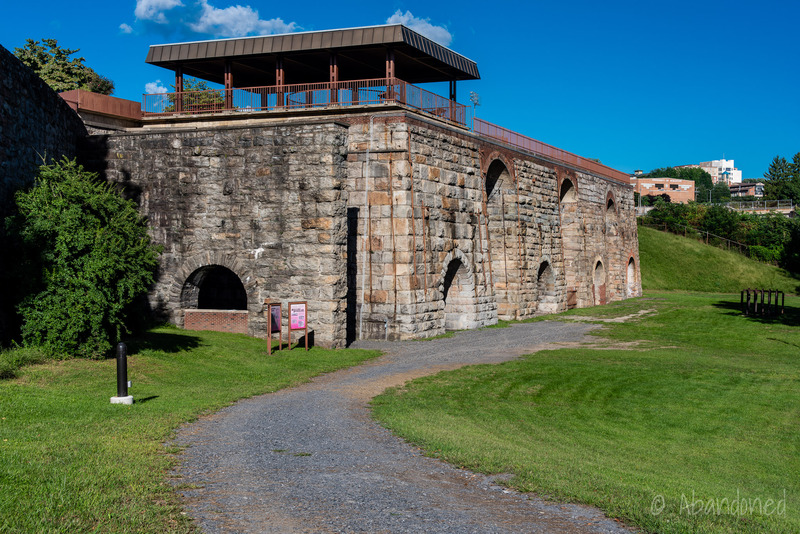 1 The engines, the largest in the United States, powered large lowing cylinders which produced the blast for the furnaces, eliminating the need for the waterwheel. Workers tapped the furnace, laid out the pig beds, and loaded the solidified pigs onto rail cars. Credit: Courtesy of the Lackawanna Historical Society and Daniel Perry. A view of the furnaces in 1892.
Credit: Courtesy of the Lackawanna Historical Society. Furnace No. 1 was dismantled in 1902 and moved to Lackawanna, but the remainder of the property was sold to the Wyoming Valley Railroad in 1903. 2 The railroad contracted with a Philadelphia company that scrapped all of the equipment and steel and tore down all of the structures except for the stone blast furnaces. 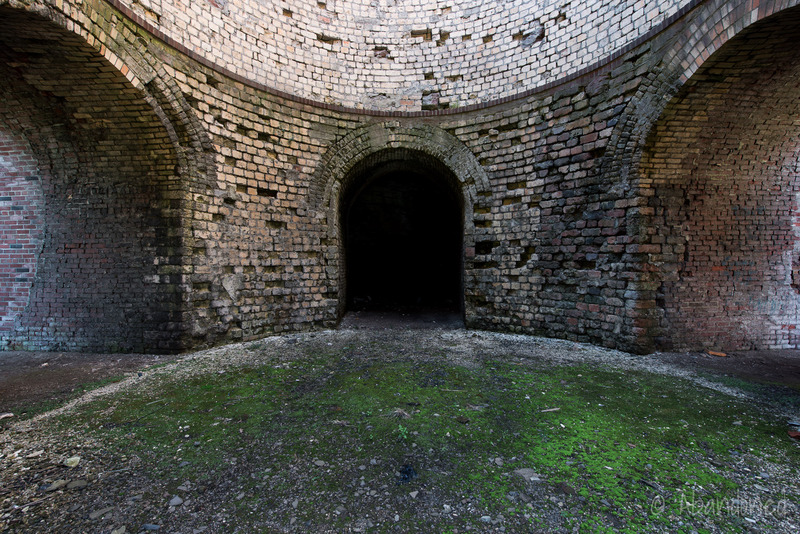 In the late 1960s, the derelict stone furnaces were acquired by the Commonwealth and transferred to the state park system. 2 The furnaces were then moved under the Pennsylvania Historical and Museum Commission in 1971, becoming a part of the Pennsylvania Anthracite Heritage Museum complex. The site was added to the National Register of Historic Places in 1991. All of the furnaces still contain the refractory brick linings. 2 Furnaces No. 2, No. 4 and No. 5 contain portions of the hearths. Perry, Daniel and Diane Reed. “Lackawanna Iron and Coal Company Furnaces.” National Parks Service, U.S. Department of the Interior, article. “Lackawanna Iron Historical Marker.” Explore PA History, 2011, article.